Dehradun, February 18: Former Jawaharlal Nehru University (JNU) student leader Shehla Rashid was booked by the Uttarakhand police for allegedly spreading fake news of Kashmiri girls being trapped inside a hostel room in Dehradun in the aftermath of Pulwama terror attack. A case against Shehla Rashid is registered at Prem Nagar police station under Sections 505, 153 and 504 of Indian Penal Code. Reacting on the case registered against her, Shehla Rashid said she was paying a price for seeking justice under the BJP government. "So, @uttarakhandcops have filed an FIR against me, but they have yet to take any action against Vikas Verma Bajrang Dal convenor who is speaking to national newspapers, owning up to the mob attacks, ordering Kashmiris to leave Dehradun. Can't say who rules Uttarakhand anymore!" she tweeted. 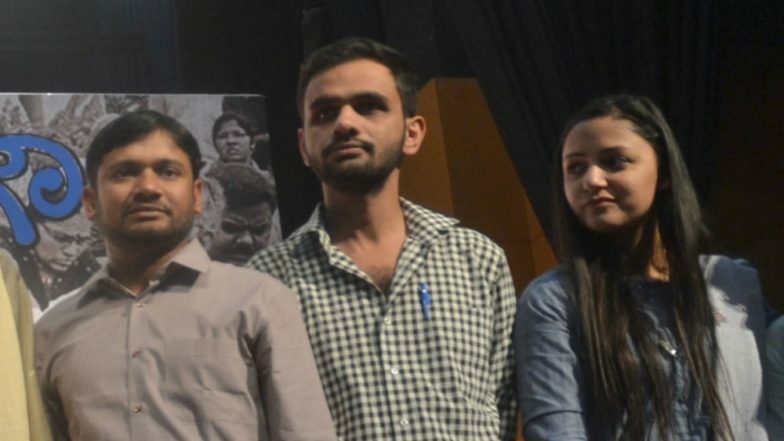 Three days after the Pulwama attack, Shehla Rashid claimed that few Kashmiri girls had to lock themselves up as a mob had surrounded their hostel. "The girls in Dolphin Institute Dehradun are safe. @uttarakhandcops are protecting them. Rumors and insinuations that the incident had something to do with "Pakistan" are false," she later said in one of her tweets. In a series of tweets, Shehla Rashid alleged attacks on Kashmiri students living in Uttarakhand and some other parts of the country. "#SOSKashmir Throughout India, mobs are attacking Kashmiri students, verbally abusing them, asking for them to be expelled and filing false cases against them. The pretext being given in each case is that they said Pakistan Zindabad - even police is buying into these false claims," she tweeted. However, the Uttarakhand police denied media reports that some Kashmiri girls were trapped in their hostel for hours. "There were rumours yesterday that a few Kashmiri girls were trapped in a hostel in Dehradun for hours due to the presence of an angry mob. This is not true as the police sorted out the issue. Initially, there was some confusion regarding pro-Pakistan slogans raised by the Kashmiri girls, but later the matter was resolved by the police," a top cop said. Since Friday, right-wing organisations such as the Akhil Bharatiya Vidyarthi Parishad (ABVP), Bajrang Dal and Vishva Hindu Parishad (VHP) have been holding protest marches here raising anti-Pakistan slogans in the wake of the Pulwama attack. The situation turned worse after a couple of Kashmiri students studying in the city allegedly posted some anti-national comments on social media, leading to trouble around a couple of educational institutions, the police said.